It’s a given. If you live on the wet side of the Pacific Northwest, and it’s not summer, you’re going to have rain. It may be fairy-fingers rain that tickles your face, whispers in your hair. A downpour that turns gardens into bogs and potholes into sinkholes. Or sideways-raging rain that flips your umbrella inside out, and power washes discarded fast-food wrappers to Nebraska and back. Don’t get me wrong. Rain is more than welcome now, after three years of drought. But it wears on you, waking up day after day to a tattoo of drops on the windows and skylights. Waiting for this fingernails-on-blackboard sound to lessen or stop. Hunkering long, dark hours indoors to write, read or indulge in other indoor sports. At some point you huff and say, “Flake it! I need daylight, fresh air and outdoor exercise. What’s a little rain? !” So you slip into your jacket, rain topper and garden clogs, and venture out to scoop puppy poo. Clean up the side yard. A chore you’ve let slide since the deluge began. Productive exercise which will make you feel better, and also encourage those welfare “companion animals” aka “dogs,” to go do their biz despite the downpour. Back indoors for more hours of boredom, punctuated with moments of sheer terror when the wi-fi dies, you consider better ways to amuse yourself outdoors. You ARE outdoorsy, after all. Maybe a little walk in the rain, no chore required, will lift your spirits. Maybe you should embrace limitations, walk with them, try to turn them into blessings. Whatever. You suit up once again, hope springing eternal and all that. Out you go. First you slip on the wet step and barely catch yourself. Then you’re blinded suddenly by a raindrop the size of a softball. Wind buffets your body while rain soaks your socks. You head home. Another day and night indoors. Cabin fever sets in, big time along with depression. This can’t go on. But. Are you going to give up? Let serial squalls and storms keep you down? No! Are you a wimp, or Master of Your Fate? An hour later, dressed like a flat-hatted, poncho-togged Clint Eastwood in “The Good, The Bad and The Ugly” — minus the cheroot — you stand beside your saddled horse. He shoots you a baleful look as you stare through the barn doorway at a wet curtain of Amazon-forest proportions. “REALLY?” he seems to say. “Let’s do this,” you reply, voice firm with resolve. You swing into the saddle, arrange your riding poncho over it and part of Brad, and firmly ride out. It will be exhilarating, to ride in the storm. Energizing, to laugh at the elements when no one else is riding (except those who must, like cowboys and mounted police). Maybe even kinda fun? Kaplop, squish, splat, go your hoofbeats around the puddled outdoor arena. Temporary blindness ensues from poncho malfunction. Water dribbles under your seat. Great: wet unmentionables. Twenty minutes later, looking like drenched rats or Ninja mud-wrestlers, you and Brad are back in the barn. Steam rolls off your backs. Rain courses down your legs to pool at your feet. Cuss words — or in Brad’s case, green slobber — spews from your lips. Well, you did it. Not pretty, but you did it,. Cowgirled up and rode, dammit, in the rain. Whoa! Stop the presses. Throw a party. Strike a medal. Riding in the rain, doing just about anything in the rain, especially endless hard rain with wind, is no picnic. It takes planning. You wouldn’t do it every day. But you know? Sometimes you just gotta saddle up and do it. Put your head down and go. Take it as it comes. Once dried off, back in your cave and glowing with warrior pride, you see life differently. It looks a little better. And there’s this: Riding in the storm beats the bejabbers out of boredom. Horse whisperers. They are a special breed, aren’t they? 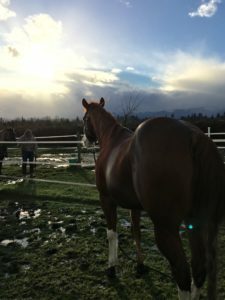 Able to move near a wild or fractious equine, make a simple gesture, take a certain pose and say a word or two that transforms the animal into a lap dog. Well, kinda. If it’s a very big lap. But you get my drift. Horse whisperers — and dog whisperers, thank you, Cesar Millan — seem to mysteriously persuade the timid, hesitant mouse or aggressive, fire-breathing dragon into a useful and compliant partner. But what of the timid or hesitant BOOK that lulls a reader to sleep? Alternately, how to tame the charging word-dragon that roars into a writer’s or other artist’s brain, and threatens with one exhaled breath to immolate your entire project while still a-birthing? A book whisperer knows how to get the story’s (read: author’s) attention and respect. He or she can persuade a book-in-progress to bend to his/her will and wisdom so that it moves the way it should to share a life-truth through good storytelling, but also to connect positively with readers and make them excited to open that book again. If you are lucky, you will have such a wizard in your contacts. Or you will be referred to someone with a knack for rooting out the problem with your creation. With the experience to confront it in the right way. And with the grit to fearlessly march in and split an infinitive if it sounds right, or end sentences with a preposition, if that’s what’s called for. Hey, if you don’t rattle a few grammatical cages, how do you put your unique writing brand on the fiction beast? But, you say, I cannot find, or worse, AFFORD, a book whisperer. I am happy to say I also play “whisperer” for those in my critique group. However sometimes in the process of writing and editing — between critique sessions or just for the hell of it — the plot balks. It sinks into a sulk. It will NOT move forward nicely, or crashes into the fence when I urge it forward. At such times I have no choice. 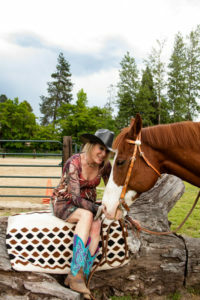 I must take a calming breath, pull on my big-cowgirl boots and become my own book whisperer. First, I size up the problem. Then I break it into doable chunks. Zero in on the point of where it all went rogue, often in a simple bit of dialog or a thought. If I massage it, change a word or sentence, point it in another direction, will this section work? If I just cut the offending parts, maybe the rest will relax and behave as it should. I fiddle, I tweak, or I crack the whip. The doing, the trying this or that in escalating increments, does the trick. Fretting, overthinking, doesn’t. Sometimes we need shouting or other extreme measures to affect change. It gets attention. It occasionally works. But many times, not so much. Neat to know. Eureka! This found or re-found incremental approach, backed up by knowledge and assurance, works for writing. Better, it can be applied to other challenging life situations. Like, say, cake-baking, child-rearing and nation-shaping — not to draw too many parallels between these. I wouldn’t want to get trampled here.